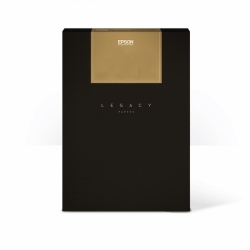 Epson Legacy Fibre is a 100% cotton fibre paper with a white coating on a smooth, matte finish. This paper combines an extremely smooth surface with a matte finish making it an ideal photographic / fine art dual purpose paper. It has an industry leading microporous inkjet receptive layer that produces deep, rich blacks (Dmax), expanded color gamut and gentle tonal gradations and will provide outstanding image permanence and durability.